The EMC New Year meet 2012/13 was at Invergarry Lodge which is a perfect sized venue for the EMC. 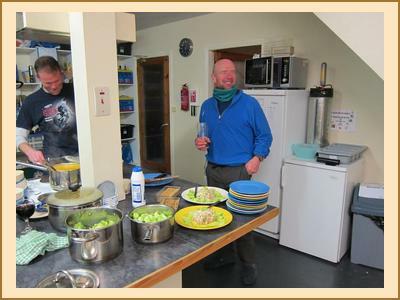 On the 31st we had our traditional communal meal with excellent food provided by all the chefs. Our menu consisted of: salmon mousse, leek/celery and stilton soup, butternut squash and sweet potato soup followed by beef casserole, chicken, bacon and mushroom casserole or veggie curry with vanilla cheesecake, chocolate and lime cheesecake, sticky toffee pudding or apple crumble for desert. If you still had space after all that, enough cheese to feed a small army. We had enough food left over for the 1st Jan too and various members had sticky toffee pudding for breakfast or took some home for later. On top of all the food we had a keg of real ale which disappeared quickly until the gas ran out. However, all was not lost, a syphon was improvised from two platypus tubes and gaffa tape and the remainder of the beer extracted successfully. The hostel chicken befriended Mike after he dropped some sesame seeds when preparing lunch. From that point on the chicken followed Mike whenever he went outside. It’s possibly just as well the chicken didn’t know what Mike had cooked otherwise it might not have been so keen to chase after him. 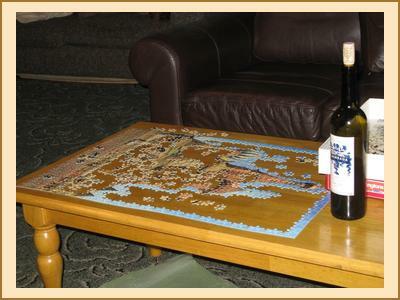 The weather forecast for the meet really wasn’t great, so much so that one member turned up with a 1000 piece jigsaw should cabin fever take sufficient hold. The jigsaw didn’t get finished and the weather actually ended up being a lot more pleasant than it had initially appeared with pretty much everyone getting some good views of the snowy hills. On the 31st Mike & Fiona R climbed Sguman Coinntich near Glen Shiel, Kenny, Alison Ewan, Alan, Anne climbed Carn Ghluasiad also in Glen Shiel, Sara and Pete did the Loch Lochy Munros, Ian, Fiona M, Chris and Martin drove along Loch Quoich to climb the Corbett Sgurr nan Eugalit. Nigel and Fiona C did Drumm Fhada after the flooded Loch Arkaig road prevented plan A (completed on the 1st after the loch went back down). Christine, Margaret and Gillian climbed a graham near Glen Doe/Drumnadrochit. On the 1st of January a party of 6 headed for Druim Shionnach hoping to get some winter climbing in before the turbo thaw began on the 2nd. Kenny and Alan managed to find a grade I gully in reasonable nick however the remaining climbers found soggy dodgy snow and retreated having named the gully they were initially ascending “death gully” due to the very unpleasant conditions. 4 members headed down the Loch Arkaig road with Fiona C and Nigel tackling Sgurr Coinnich and Mike and Fiona R doing Geal Charn and Meall na h-Eilde. Ian, Sara and Pete did the Loch Quioch Munros of Gleouraich and Spidean Mialach, Martin took part in the Aonach Mor Uphill Race finishing an impressive 29th. Margaret and Gillian initially planned to go for a walk but Margaret’s cold got the better of her and she managed to get a lift back from Aonach Mor with Martin and Christine. Gillian managed a half day of snowboarding. On the 2nd a lot of people headed home. Pete and Sara were doing this via some Munros near Loch Lomond. Chris and Fiona headed of to Glen Doe planning to do the Corbett Carn a’Chuilinn. Fiona R, Mike and Ewan took a wander into Coire Adair to stretch their legs. Soggy snow but still lots of it so we just need the cold weather to return.